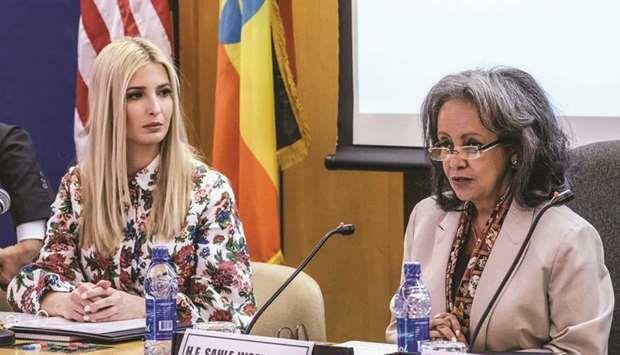 (MENAFN - Gulf Times) Ivanka Trump said she would campaign for women's right to own and inherit land in Africa as she visited Ethiopia yesterday to promote a $50mn US development project. 'Eighteen countries in the world still have laws that allow husbands to legally prevent their wives from working. Half of these countries are in Africa. We can and we must address these barriers to women's equality and countries' prosperity, she added. She did not spell out how she would tackle the problems. But she was promoting the Women's Global Development and Prosperity initiative, which officials have said aims to economically empower 50mn women by 2025. Ivanka Trump met Ethiopia's Prime Minister Abiy Ahmed and was due to wrap up her four-day African trip with a visit to Ivory Coast. Ivanka met with religious leaders representing the diverse faiths of those killed in the crash, laid a wreath and observed a moment of silence at the Holy Trinity Church. 'My heartfelt sympathies to all the victims' families and loved ones, she tweeted after the visit. She announced $350mn towards a programme 'supporting women-owned, women-led and women-supporting projects in Sub-Saharan Africa. Today, she heads to Ivory Coast in West Africa, for the second leg of the trip.